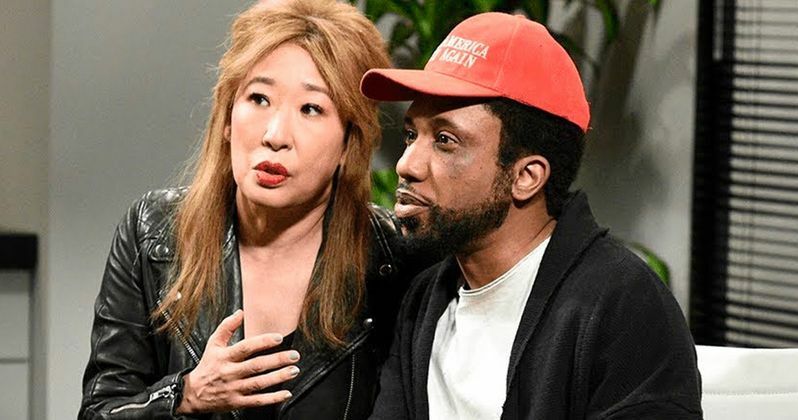 Saturday Night Live weighed in on the controversy surrounding Jussie Smollett, with Chris Redd portraying the Empire star in a scathing sketch. On the new episode of the long-running sketch comedy series, Grey's Anatomy star Sandra Oh served as the host, appearing with musical guest Tame Impala. For one sketch featuring a meeting between Smollett and Empire producers, Oh played the actor's agent, with Kenan Thompson portraying Empire head Lee Daniels. Clearly, the skit is none too kind to Smollett, suggesting the folks at SNL aren't quite buying the actor's assertion he didn't make up the story about his assault. In the skit, Jussie Smollett is running two hours behind for an Empire meeting about his character's future. When he does finally arrive, he's sporting a black eye and wearing a MAGA hat. "Guys, you are not gonna believe what just happened to me!" Smollett steadfastly exclaims once he arrives, adding, "I got attacked... again!" Nobody is convinced, but Smollett pleads his case by presenting a "bag of clues" to help him catch the attacker. Included in the bag are Crest Whitestrips, three wooden letter K's, and a plush doll of Tinky Winky from Teletubbies. Heavily insisting he really was attacked, another producer (Kate McKinnon) sarcastically suggests they should call the police, resulting in immediate panic from Smollett. "They said I could never call again, that's part of the deal," Smollett retorts. As we all know, Smollett has been the subject of national controversy in recent weeks. In late January, the actor reported he had been the subject of a hate crime, alleging two men had assaulted him for discriminatory reasons. According to Smollett, the men threw bleach on him and put a noose around his neck. After locating the suspects implicated in the assault, a pair of brothers who'd worked with Smollett on Empire, police reportedly uncovered evidence suggesting Smollett staged the attack. Smollett was then arrested and charged with 16 felony counts, although the TV star maintained his innocence. Things then took another interesting turn last week when all of the charges against Smollett were dropped, creating such a public backlash that even Donald Trump weighed in on the controversial decision. Former SNL alum Chris Rock also had some harsh things to say about Smollett on Saturday at the NAACP Image Awards in Hollywood. The comic legend suggested he was told to do "no Jussie Smollett jokes," leading to a short monologue mocking the Empire actor. "What a waste of light skin. Do you know what I could do with that light skin? That curly hair? My career would be out of here! I'd be running Hollywood," Rock quipped at the event. "What the hell was he thinking? You're 'Jessie' from now on. You don't get the 'u' no more. That 'u' was respect. You ain't getting no respect from me!" Empire ratings have fallen since the hate crime scandal, even with Smollett's removal from the final two episodes of the season. It remains to be seen whether he'll be returning to Empire now that the criminal charges against him now dropped, but as the SNL skit suggests, public perception isn't on his side. You can watch his SNL sketch about Smollett in the video below.